Kjell Magnus Økland: Norwegian Steam / Jåttseglarane : English information : What is the America's Cup? - What is the America's Cup? - Do you want to know more? What is the America's Cup? The America’s Cup is the most prestigious race in the sport of sailing, and the oldest active trophy in international sport, predating the Modern Olympics by 45 years. The sport attracts top sailors and yacht designers because of its long history and prestige. It is not only a yacht races, it is also a test of boat design, sail design, fundraising, and management skills. The Cup was named America's Cup after the first yacht to win the trophy, the schooner America. 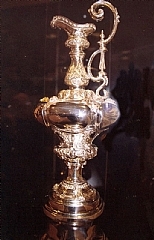 The trophy remained in the hands of the New York Yacht Club of the United States from 1857 (when the syndicate that won the Cup donated the trophy to the club) until 1983 when the Cup was won by the challenger, Australia II of Australia, ending the longest winning streak in the history of sport. The America’s Cup regatta is a challenge-driven series of match races between two yachts. Any challenger who meets the requirements specified in the Deed of Gift, which governs the regatta, has the right to challenge the yacht club that holds the Cup. The America’s Cup is a race between the winner of the challenger selection series and the current holder. If the challenging team wins the cup, the cup’s ownership is transferred from the defender’s yacht club to the winning team’s yacht club.